The buzz is true – Costa Rica is a surfer’s paradise. There are hundreds and hundreds of beach towns, from little villages to bustling cosmopolitan centers, and just as many surf breaks. The country counts more than 700 miles of coastline between both the Pacific and Caribbean coasts. With warm tropical water, long rolling waves, and sunshine most of the year, what more could you want? A bit off of Costa Rica’s tourist “super highway” is the quiet and still-undisturbed beach of Santa Teresa. Near the tip of the Pacific’s Nicoya Peninsula, Santa Teresa is not completely off the radar – it won “Best Beach in Central America” for 2012 and “Top 10 in the World” for 2011 in Trip Advisor’s Traveler’s Choice Awards. Nonetheless, Santa Teresa retains its charm as a small fishing village and intimate collection of international boutique hotels and vacation homes. 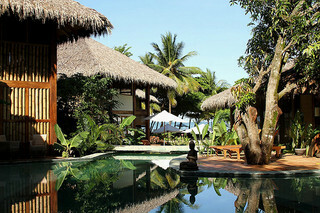 Also a 2012 Trip Advisor Traveler’s Choice Award winner is Pranamar Oceanfront Villas & Yoga Retreat. Set right on the water at Santa Teresa Beach, the gorgeous specialty hotel features surfing and yoga holidays and all-inclusive yoga vacations in a healthy, environmentally-friendly setting. As a guest, you can stay in luxury two-story villas or elaborate beachfront bungalows in abundant tropical gardens. At Santa Teresa, you’ll be star-struck by the beauty of nature and the jungle that hugs the coastline, pouring down from the mountains to light sand beaches and the clear aquamarine sea. Famous for year-round surf, its hallmarks are pristine beaches, both beach and point breaks, easy-to-ride waves in warm water, and picture-perfect sunsets. So, whether you are a beginner trying surfing for the first time or already have saltwater running through your veins, Pranamar Villas can set you up with the best beach and surfing holiday you can dream. Looking for a tropical beach holiday and maybe to check out what this surfing craze is all about? Pranamar Villas offers daily surf lessons for beginners, intermediate surfers, and even for families all together! 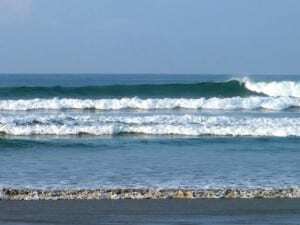 Beginner and intermediate surf classes last 2 hours and focus on skills and then, surfing. Cost is $65 per person and includes everything you need to surf (surfboard, surf wax, leash and rash guard). You’re guaranteed a 2 to 1 student to instructor ratio. Or, try a private surf lesson. Also 2 hours, you’ll start out with a stretching program on the beach to limber you up, and then be trained on basic surfing skills, safety tips, paddling techniques, standing up and riding a wave. With a ratio of one student per one instructor, you can guarantee that you will catch the ideal waves. Private lessons cost $80 per person. On holiday with your family and want an active, fun adventure together? Try the family surfing lesson! You’ll have a 2:1 surf instructor ratio while learning, both on the beach and in the water. Enjoy a great family day of fun and laughter for $200 for 4 persons, including all equipment. Advanced surfers, surf’s up for you too. 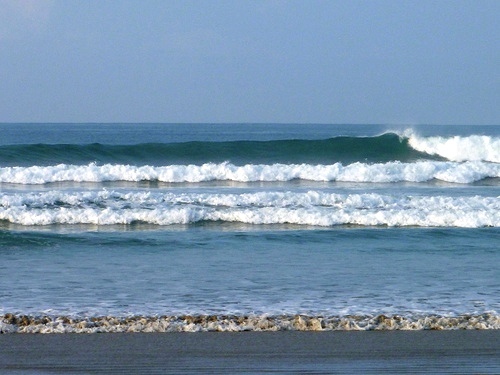 Pranamar has Advanced Surf Tours available by the day. Get the insider’s local surfing experience at the best breaks between Cabuya, Montezuma, Mal Pais and Santa Teresa. Actual surf sessions last 2 hours and cost $80 per person; no more than 4 persons per guide. 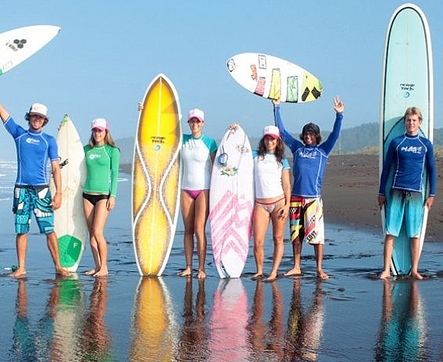 Complete Costa Rican surfing or surfing & yoga vacation packages are available as well from Pranamar. You can choose from 3-day, 5-day and 7-day packages, either simply surfing or the best of both worlds of surfing and yoga. All accommodations, daily surf (and yoga) lessons, breakfast, and even a massage during your stay, are included. Surf instructors are from Del Mar Surf Camp; owned and operated by locals and recognized by the Costa Rican Tourism Board, Del Mar has been teaching people how to surf since 2003. Instructors are certified in CPR, First Aid and Open Water Rescue, keeping you safe while you surf. Del Mar exclusively handles Pranamar Villas’ surfing program.